A clever, fast, and seamless solution for conversion from legacy halogen fixtures to their LED counterparts, the daylight-balanced ReLamp 1K LED for ARRI 1K Plus / T1, Strand 1K & Colortran 1K Fresnels from Visionsmith brings you all of the benefits of a retro-fit and none of the hassles - in fact it's not even a retrofit, it's a simple lamp swap! 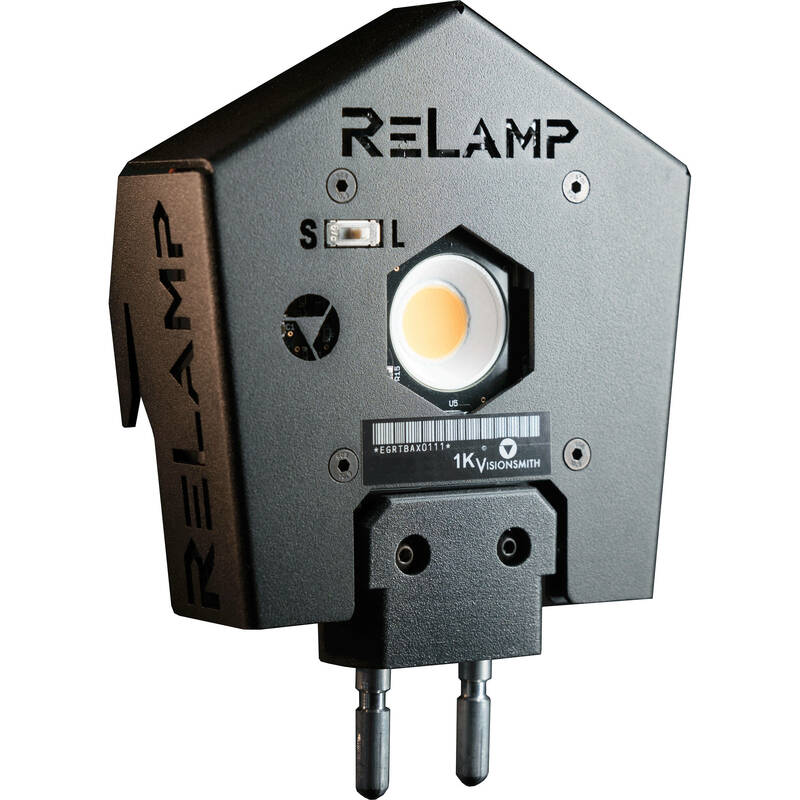 The ReLamp 1K fits into the very same G22 Medium Bi-Post base that halogens do, and outputs the same power that halogens do, while consuming just 100W of electricity, eliminating both heat that might make the talent uncomfortable and high air-conditioning costs needed to cool the studio when using halogens. Typically, the ReLamp 1K will save you 80% of air-conditioning and running costs with an ROI of mere months. Re-lamping is seamless, challenging you to differentiate between the halogen and LED fixtures. And the accuracy and precision of color rendering is indisputable as evidenced by the ReLamp's CRI/TLCI ratings of 93/95. Ready for worldwide use the ReLamp 1K runs on 90 to 250 VAC voltage and can be dimmed from 0 to 100%. Cinewhite LEDs come from the cutting edge of LED technology. With impeccable color rendering and Purebeam technology, the light quality must be seen to be appreciated. Can you tell which is the halogen and which is the LED? The color is just what you hoped for: it gels correctly, blends with your existing fixtures, and projects an impressive light field. Visionsmith ReLamps run barely warm to the touch. ReLamp LEDs are eight times more efficient than halogen at putting light on the target. Additionally, there's no heat, while a halogen grid is like a grid of industrial space-heaters, compensated by heavy-duty air conditioning. If you're running lights for 12 hours a day, the numbers add up fast. ReLamp LEDs experience no color-shift with dimming, so fussing with scrims is a thing of the past. This isn't anything like an LED retrofit, it's just a bulb swap. Upgrading to LED is no longer a process of throwing out all your old favorite lights, and rewiring to support the new expensive LEDs. You can literally just upgrade from a halogen lamp to a ReLamp LED. It's much faster. There is no rewiring at all. It costs four times less in most cases. You still get all the benefits of LEDs. Box Dimensions (LxWxH) 11.9 x 7.9 x 4.5"
ReLamp 1K LED for ARRI 1K Plus / T1, Strand 1K & Colortran 1K Fresnels (Daylight) is rated 1.0 out of 5 by 2.